The CD38 antigen is a 45 kDa single chain type II integral membrane glycoprotein, with the NH2-terminus inside the cytoplasm. CD38 is an enzyme with several activities such as NAD glycohydrolase, ADP ribosylcyclase and cyclic ADP ribose hydrolase. CD38 is expressed on activated T and B lymphocytes, NK cells, monocytes, plasma cells and medullary thymocytes. CD38 expression appears to depend on the differentiation and activation of the cell. In the B cell lineage, CD38 is expressed in early stages of B-cell ontogeny, lost during maturation and re-expressed upon terminal differentiation to plasma cells. Similarly, CD38 is expressed on thymocytes and at a high level on activated T cells. Most mature resting lymphocytes of both B and T lineages do not express the CD38 antigen. 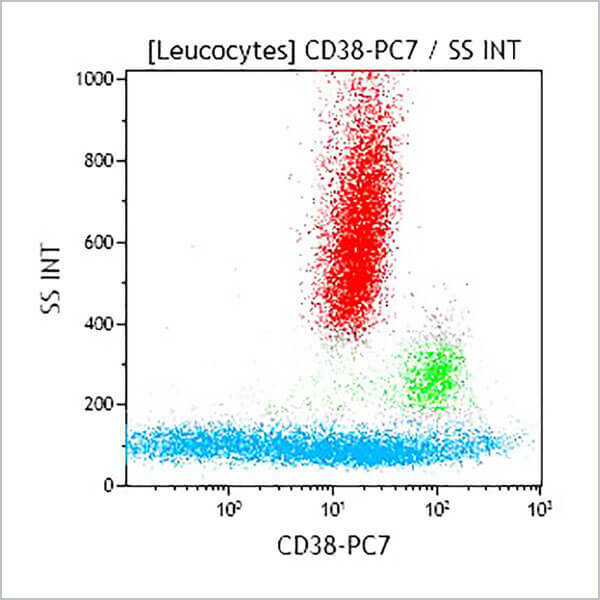 CD38 is widely used as a marker to study T and B lymphocyte activation.